CAPE ELIZABETH, Maine (July 10, 2018) – ON Semiconductor, a longtime TD Beach to Beacon 10K sponsor, has increased its support this year to boost the race’s nationally recognized sustainability program, race organizers announced Tuesday. “With ON Semiconductor’s focus on developing energy efficient innovations, we can’t think of a more appropriate corporate partner to have paired with our award-winning sustainability program,” said Race President Mike Stone. 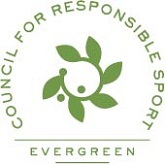 The Evergreen Certification from the Council for Responsible Sport required a rigorous review of the TD Beach to Beacon’s environmental and social sustainability programs, which range from comprehensive recycling to reducing carbon emissions to raising money for charities and leaving a positive legacy in the community. 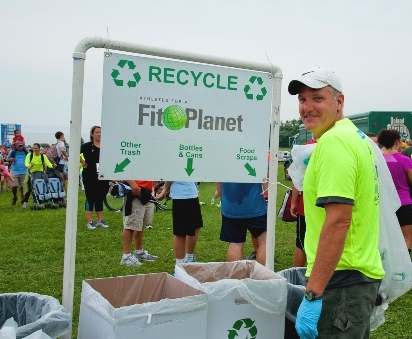 The increased financial support from ON will be vital to helping the TD Beach to Beacon achieve those goals, said Bruce Rayner of Athletes for a Fit Planet, the race’s sustainability consulting partner. Race Founder Joan Benoit Samuelson said the TDB2B’s environmental practices reflect the values of the race and the state of Maine. Phoenix-based ON Semiconductor operates a chip manufacturing facility in South Portland. In addition, Woodard & Curran, a Portland-based construction engineering firm, has signed on as a new sponsor of the race and will add further support to the sustainability efforts, Stone said. 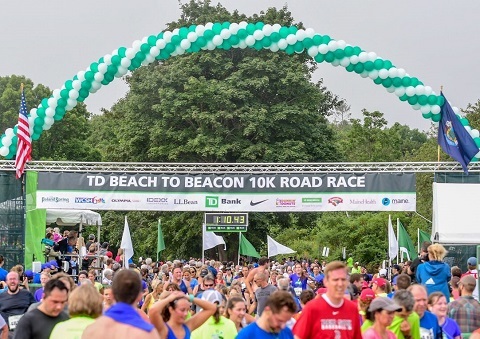 Race organizers also announced that outdoor retailer L.L.Bean, the longtime sponsor of race awards, will again provide a $10 gift card to all TD Beach to Beacon runners during the bib and t-shirt pickup at the Expo. ON and L.L. Bean are part of a group of 12 Corporate Partners responsible for the ongoing success of the TD Beach to Beacon 10K, which is set for Saturday, Aug. 4, along the picturesque shoreline of Cape Elizabeth, Maine. Corporate Partners who have been with the TD Beach to Beacon over its entire 21-year history include title sponsor TD Bankas well as Nike, Hannaford, Poland Springand MaineHealth, which this year will enhance its sponsorship by bringing in expert speakers for the medical symposium it hosts each year during race week. Other long-time Corporate Partners include IDEXX, WCSH6, Northeast Delta Dental, Olympia Sports and Dunkin’ Donuts. Local solar installer ReVision Energy, in partnership with local solar electronics manufacturer Pika Energy, will provide a solar-powered trailer with batteries to provide clean, renewable electricity to the post-race Awards Stage at Fort Williams Park. After the race, the trailer will be shipped to Puerto Rico to support disaster relief efforts. Dunkin’ Donuts, in partnership with their local franchise owners, will again provide the prize money for the American-only runner category, which debuted in 2015. The lure of a $23,000 purse each year now attracts many of the top American distance runners to the international road race. Dunkin’ Donuts also will give $3 gift cards to all volunteers and registered runners again this year. After a successful launch last year, Oakhurst Dairy will again sponsor a pair of popular race-eve activities at Fort Williams – the B2B High School Mile and the Kids Fun Run – which has been renamed Youth Night. TD Bank will again provide race images free of charge to all runners through new vendor Capstone Photography as well as a special car magnet celebrating the 21st running. Nike will again provide all runners and volunteers with a tech shirt that is made of recycled plastic. Two new prize-money sponsors were added this year – Cross Insurance Agency for the Masters category and Harvard Pilgrim for the Senior 50+ category. The 2018 race beneficiary is WinterKids, a nonprofit organization that helps children develop healthy lifelong habits through education and fun, outdoor winter activity. WinterKids (www.winterkids.org) will receive a $30,000 donation from the TD Charitable Foundation, the charitable giving arm of TD Bank, America’s Most Convenient Bank®, and also benefit from fundraising and publicity connected to the race. The TD Beach to Beacon celebrates health, fitness and giving back. In 2017, a record 6,887 runners from 18 countries, 43 states and more than 270 Maine cities and towns finished the winding, rolling, often breathtaking 6.2-mile coastal course. Thousands of spectators cheered runners along the route and at the finish. The race debuted in 1998 with 2,408 runners crossing the finish line. 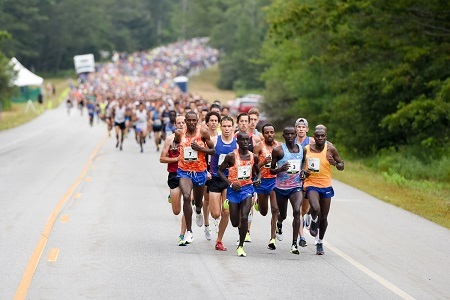 The TD Beach to Beacon attracts a large contingent of world-class athletes from the U.S. and around the world as well as top runners in Maine and New England to compete for more than $90,000 in prize money. The TD Beach to Beacon is directed by Dave McGillivray of DMSE Sports, who also serves as race director of the B.A.A. Boston Marathon. For additional information about the race, visit www.beach2beacon.org, and find the TD Beach to Beacon on Facebook, Twitter and Instagram. ON Semiconductor is driving energy efficient innovations, empowering customers to reduce global energy use. The company is a leading supplier of semiconductor-based solutions, offering a comprehensive portfolio of energy efficient power management, analog, sensors, logic, timing, connectivity, discrete, SoC and custom devices. The company’s products help engineers solve their unique design challenges in automotive, communications, computing, consumer, industrial, medical, aerospace and defense applications. ON Semiconductor operates a responsive, reliable, world-class supply chain and quality program, a robust compliance and ethics program, and a network of manufacturing facilities, sales offices and design centers in key markets throughout North America, Europe and the Asia Pacific regions. For more information, visit http://www.onsemi.com.